Home Corporate Functions Looking for a function venue? Find your perfect match! Capacity: Whether you’re hosting a year-end function for your entire company and their families or a small get-together to celebrate a milestone birthday, your venue needs to have a space that suits the size of your party. Too big and your guests will be lost inside it, too small and everyone will be stepping on each other’s toes. Location: From a great view to an easy travel distance, the location of your venue is a very important factor. In addition to having a short travel time for your guests, there needs to be sufficiently secure parking as well as a wow-factor in terms of the gardens or view. Event space suitability: The function venue has to be suited to the type of event you are hosting as well as the needs of your guests. For example, you may require a family-friendly venue, an outdoor space for an informal picnic or braai, or wheelchair access for guests. Services: The type of services offered will change from venue to venue, so be sure to get all the information you need directly from the venue itself. Some venues offer a range of catering options (both formal and informal, activities (including teambuilding activities) and additional services like set-up and take-down services. Some venues are happy to accommodate additional service providers (for example, DJs or kids entertainment providers) while others are not. Event management: The best function venues will be able to help you plan and deliver a wonderful event through their in-house event management team. This team is a great resource who can answer any of your questions, help manage your event and go the extra mile to make it truly memorable. Function venues for team building, birthdays, year-end functions and more! 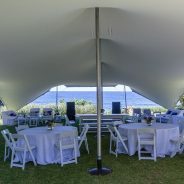 At Idle Winds, we know just how important it is that every detail is correct for your event and that everything goes smoothly. From our experienced chefs and wait staff to our event planners who will help coordinate and organise your party, our team will deliver everything you need to enjoy such a special occasion. If you have an end-of-year party or special celebration coming up, we’d like to encourage you to visit our venue, explore your options and speak to our helpful and friendly staff about our function packages. Located just 14kms from Fourways, we’re just a short trip from the city – but you’ll feel a world away! For more information on our function venue, please don’t hesitate to contact us today.